Not all fall colors need to be drab browns and oranges. 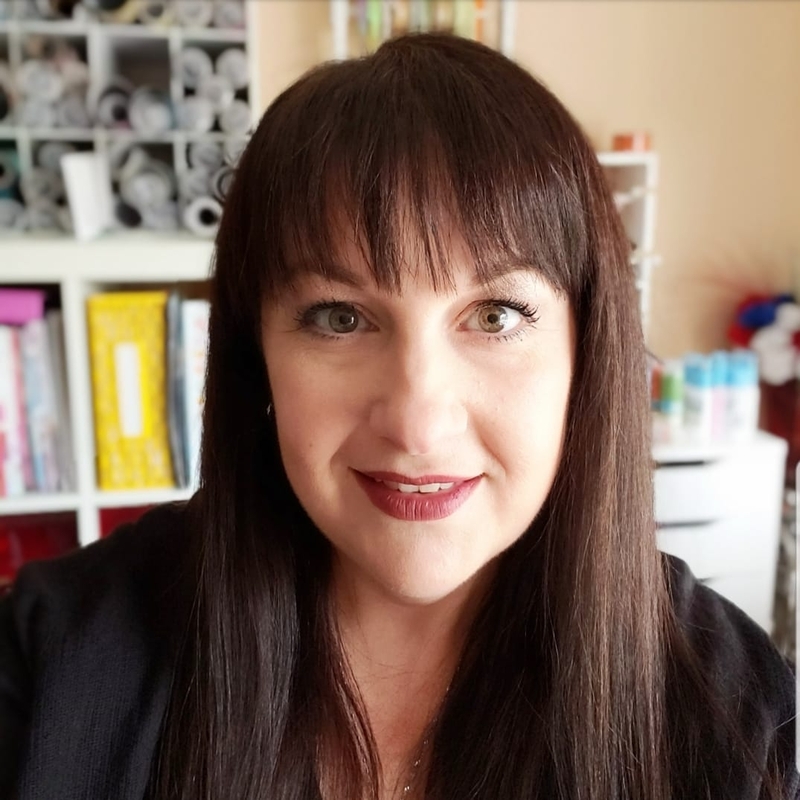 It’s fun to incorporate other colors, too, like navy blue, a perfect complimentary color for all of that orange. 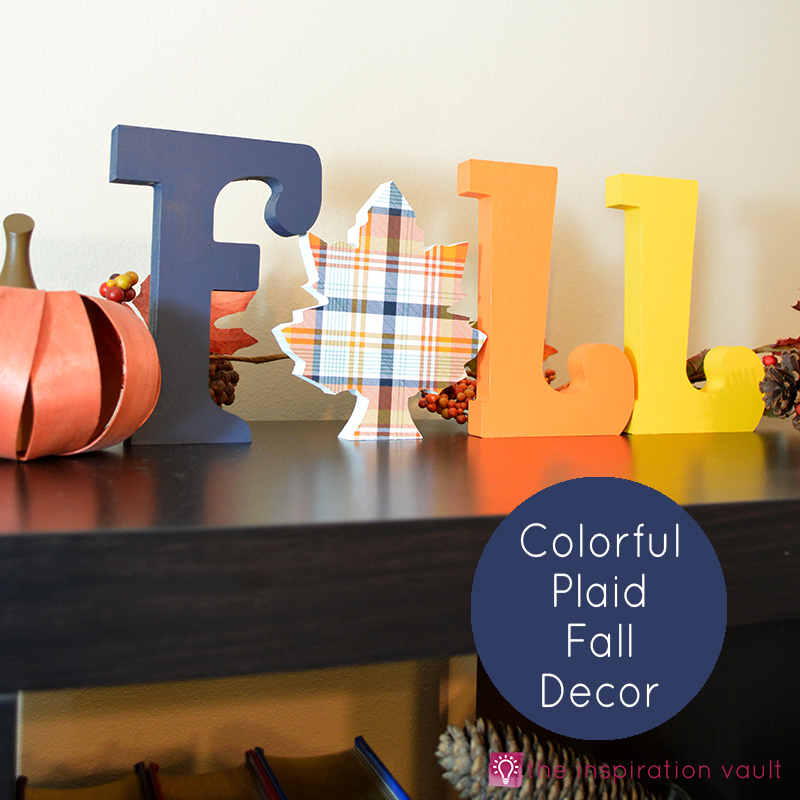 This Colorful Plaid Fall Decor project fits the bill perfectly. 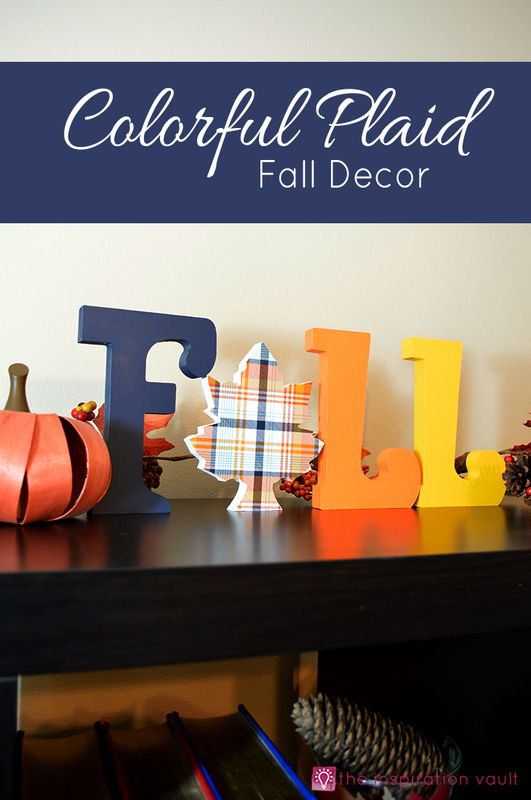 It’s still obviously fall-themed with that giant leaf, and well, the actual letters for F A L L, lol. 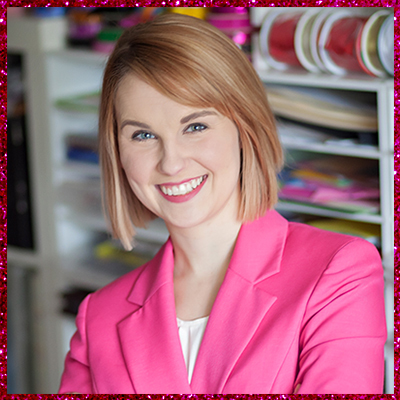 So why not mix it up a bit with some bright plaid scrapbook paper and coordinating colors? 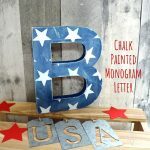 I found the letter/ leaf combo at Hobby Lobby, but you could easily assemble your own with all of the various letters available now. 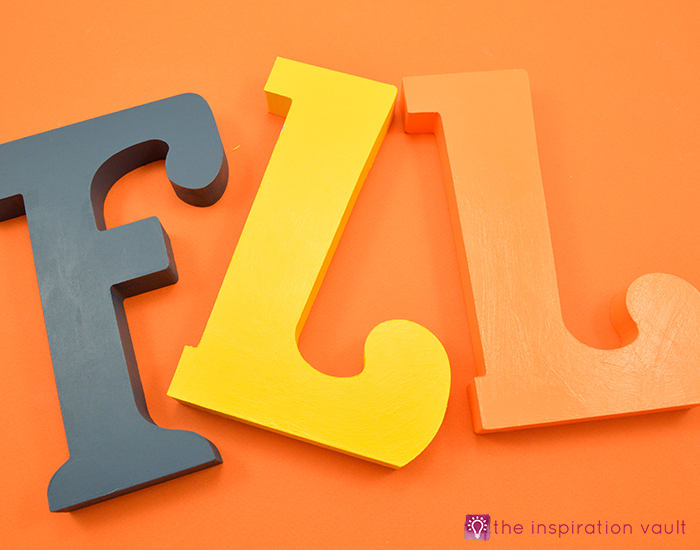 In fact, using different styles of letters for each one would look cute, too. Let’s get started. 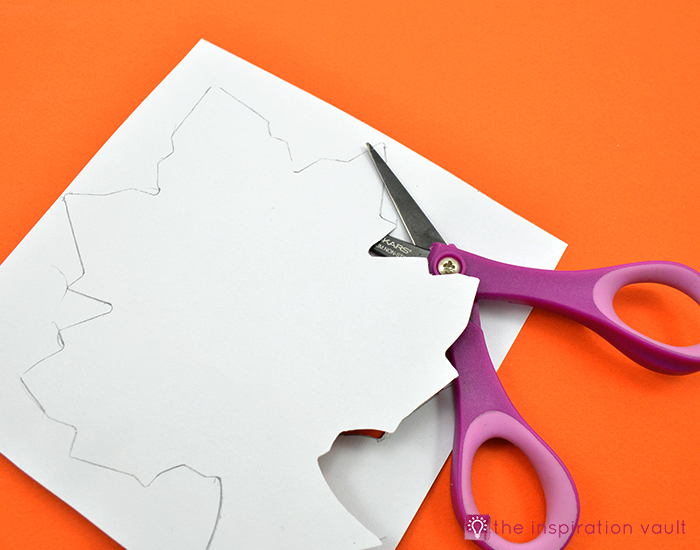 one: Use the leaf form to trace the shape on the back of the scrapbook paper then cut it out. 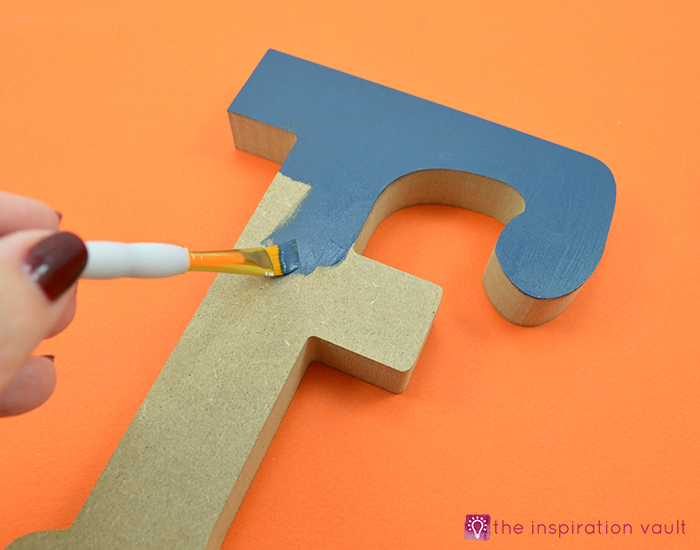 two: Paint the front, back, and sides of the letters (unless you are using dark paint like the blue) with the white paint first and let it completely dry. If you don’t, it will take so. many. layers. 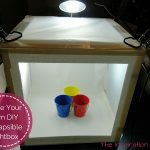 of paint to cover the darkness of the wood. 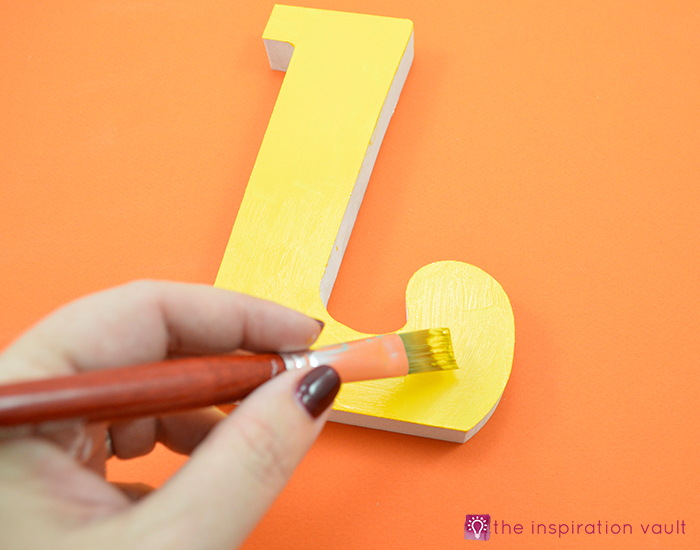 Then paint the letters with the coordinating paint colors of your choice. 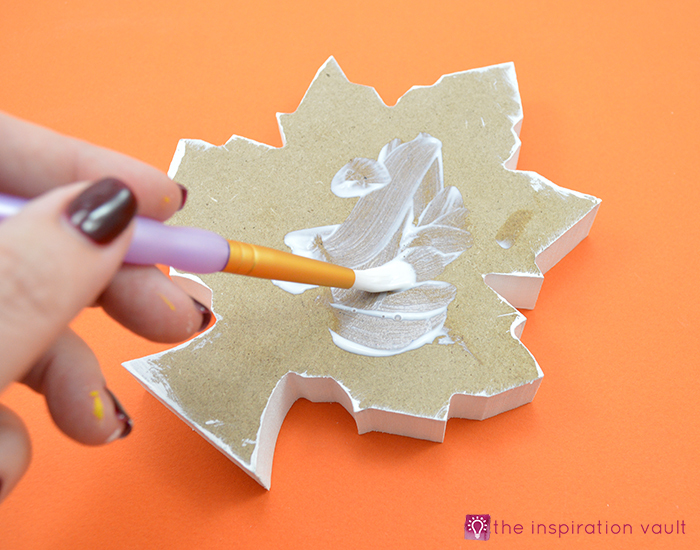 three: Paint the back and sides only of the leaf white. I used two coats. 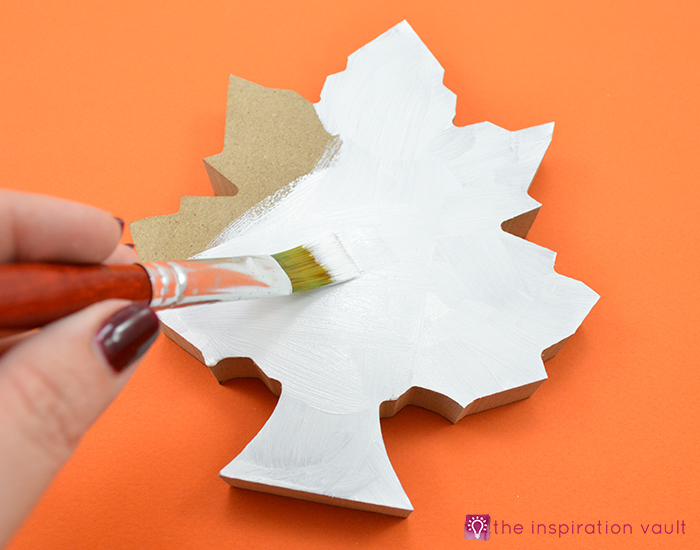 four: Apply Mod Podge to the front of the wood leaf and carefully place the paper leaf on to it so the edges line up perfectly. 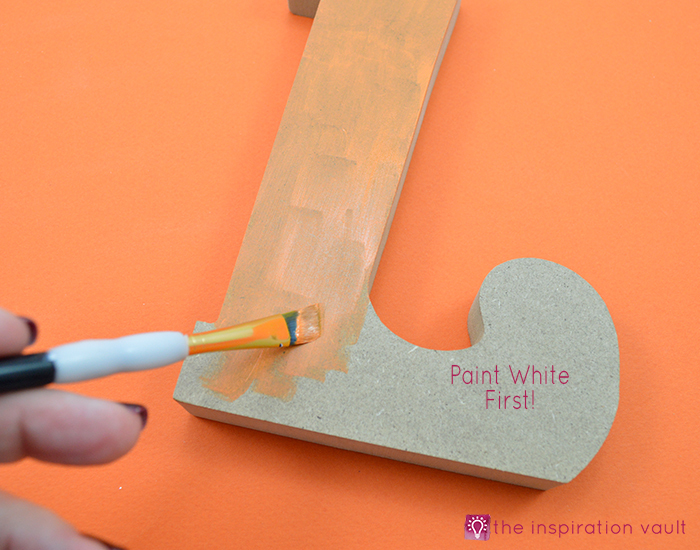 Trim off any pieces that hang over the edge. 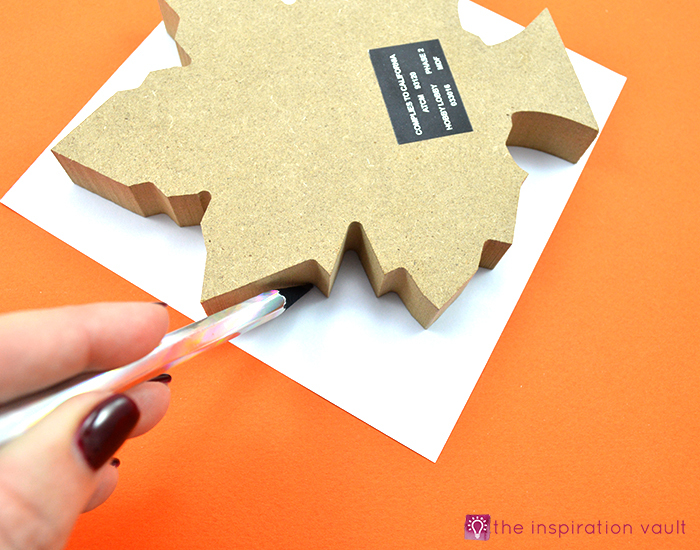 five: Apply Mod Podge over the top of the paper and smooth it out with your fingers, making sure to smooth out any bubbles. That’s it! 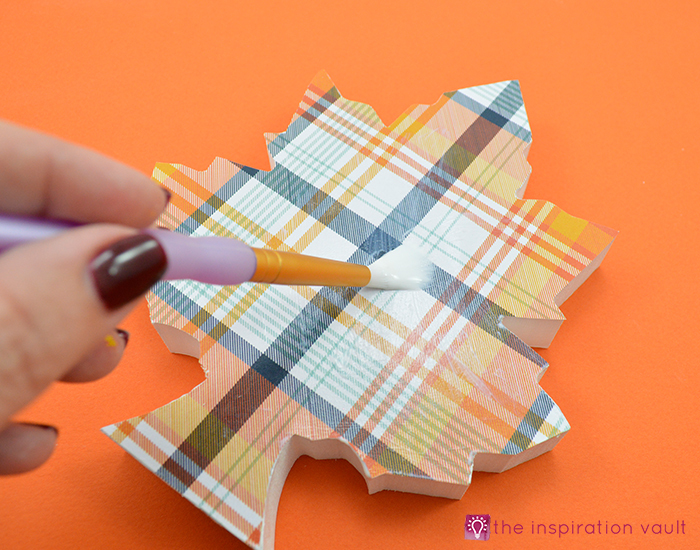 You could really go a bunch of different directions in terms of design with this Colorful Plaid Fall Decor project. 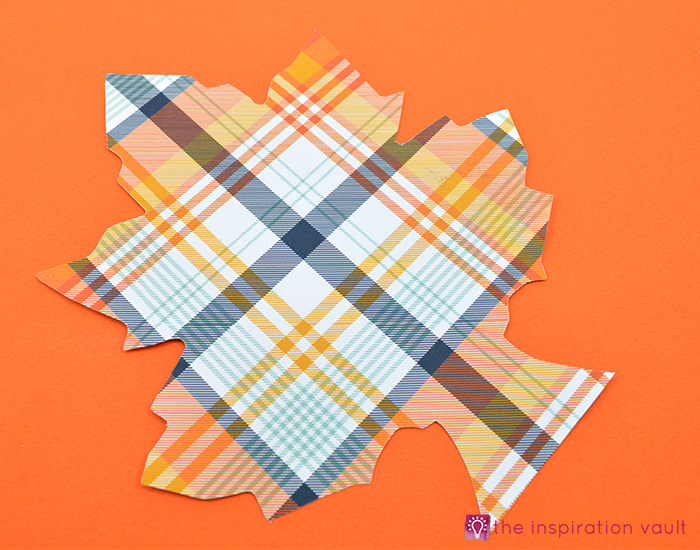 If you don’t like plaid, for instance, you could easily swap it out for a different fall-themed paper. If you prefer different color combos, that’s also super east to change. 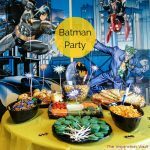 Or, if you’re feeling really crafty and adventurous, you could use four different coordinating scrapbook paper prints. 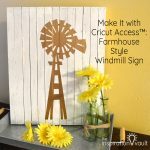 We’d love to see your version! 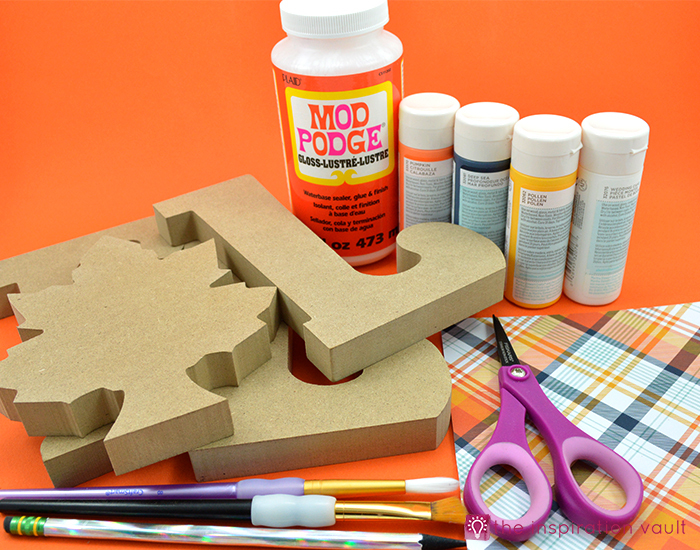 Be sure to check out our other Fall/ Thanksgiving Crafts and follow our Fall & Thanksgiving Inspiration board on Pinterest for even more ideas! Yes! 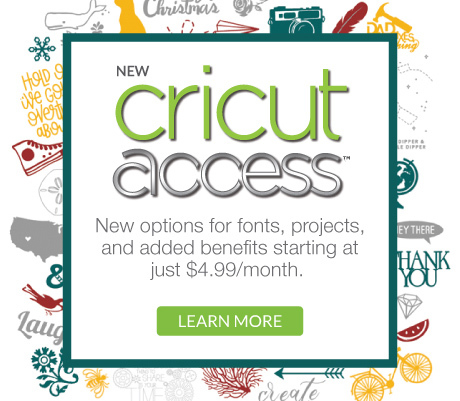 I’d love to have exclusive access to FREE printables and downloads!